Learning Accounting: What is an account? On any day in any business, there will be a great many financial transactions taking place. In order to make sense or understand what is happening in the business it is necessary to categorise and sort similar transactions together into groups. In financial accounting however the term "category" is not used and instead the term "account" is used. The word account is often abbreviated to "a/c" and thus you will see "Sales a/c" and "Wages a/c". 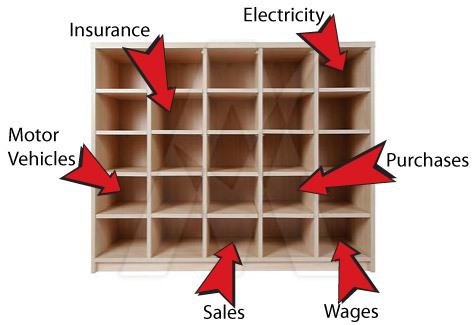 It may help you to think of "Accounts" as pigeon holes such as in the following illustration. Every time a Sales transaction occurs, you must put information about the transaction into the pigeon hole for SALES. Similarly every time the Electricity bill arrives, you must put the cost details into the pigeon hole for ELECTRICITY, and so on. Then when the time comes to prepare the financial statements, it is a matter of adding up all the transactions in the various pigeon holes. Includes accounts that summarise the outflow of money from a business or the loss or wastage of the businesss resources. For example money is spent purchasing stock for resale, and on telephone, electricity, rent, rates, wages and motor vehicle expenses). Includes accounts that summarise the inflow of money into a business resulting from the sale of inventories, services performed and general operations of the business (for example sales, rent received, commission received). This is the owners investment or interest in the business. Ownership equity can always be worked out as the difference between the total of assets less the total of liabilities. In a non-profit organisation, ownership equity is usually stated as "Accumulated Member's Funds". In a normal (profit-making) company, ownership equity is usally stated as "Share Capital"